Start of the Misery Ridge Trail just across the bridge at Smith Rock State Park. The Misery Ridge Trail ascends immediately on a scree surface at Smith Rock State Park. 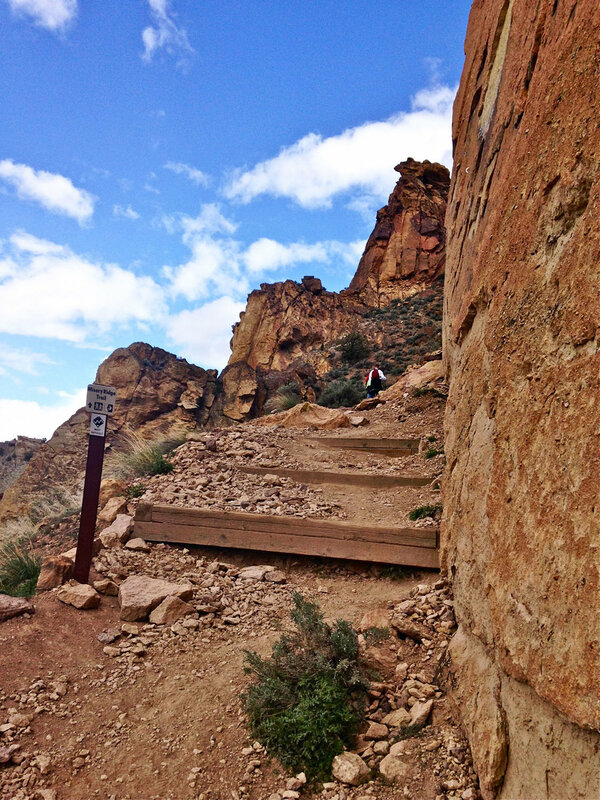 Stairs interspersed with scree on the Misery Ridge Trail help to prevent further erosion at Smith Rock State Park. Wear and tear on the much used MIsery Ridge Trail at Smith Rock State Park. 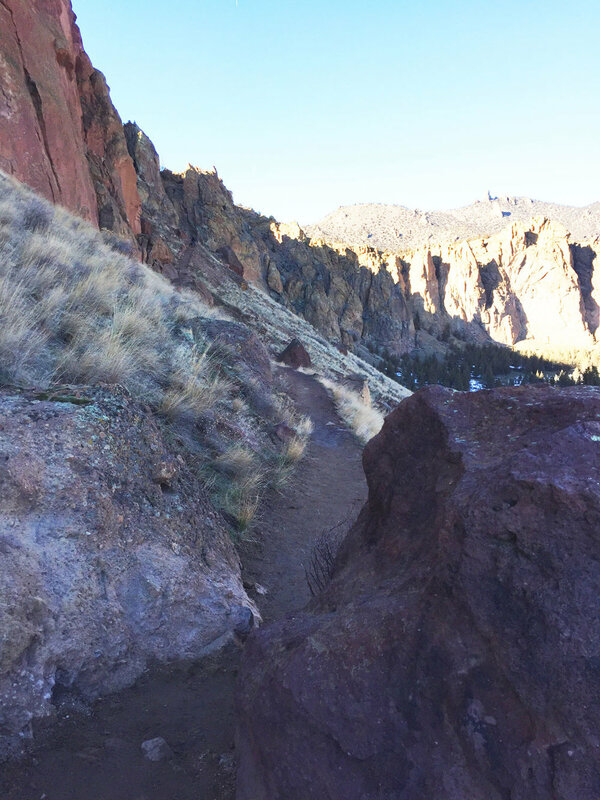 More stairs have been added each year on the Misery Ridge Trail due to accelerated erosion from those not staying on the trails at Smith Rock State Park. The Red Wall climbing area is accessed by the Misery Ridge Trail at Smith Rock State Park. Once past the Red Wall, the Misery Ridge Trail continues along the ridge with the Crooked River down below at Smith Rock State Park. A series of switchbacks doubles back and forth to snake up the Misery Ridge Trail at Smith Rock State Park. 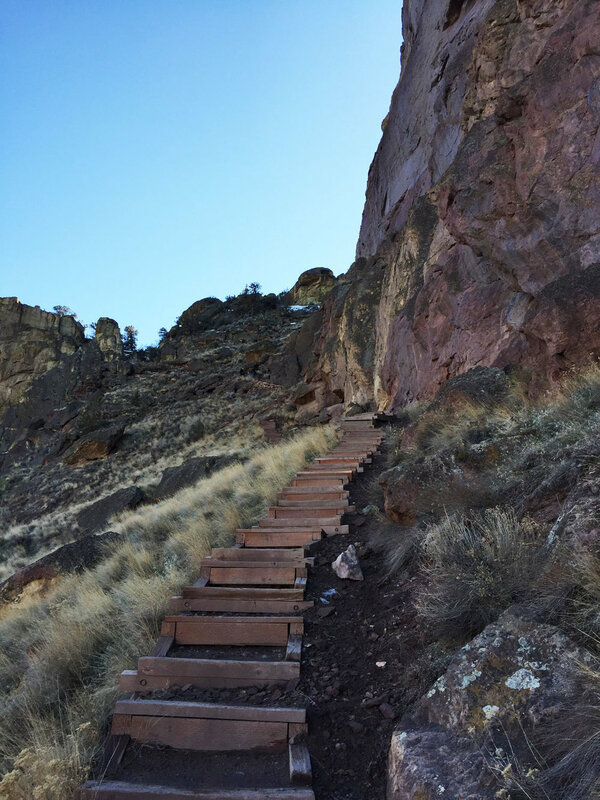 A long set of stairs has been added to the Misery Ridge Trail to recreate the path that was taken out by hikers cutting the trail at Smith Rock State Park. The flat rocks at the summit of the Misery Ridge Trail afford rest and great views of the river gorge below and the Monument Area to the left at Smith Rock State Park. A map at the summit of the Misery Ridge Trail shows your position and marks the path to the rest of the ridge trail at Smith Rock State Park. A sign just past the map points the way to walk along the ridge to see the icon pinnacle, Monkey Face. Mountain views are plentiful of the Cascade Range along the summit ridge of the Misery Ridge Trail at Smith Rock State Park. More views of the Crooked River and houses below along the Misery Ridge Trail at Smith Rock State Park. Junipers dot the ridgeline on the Misery Ridge Trail at Smith Rock State Park. More signage points the way just in case you think you're lost along the Misery Ridge Trail ridgeline on the way to Monkey Face at Smith Rock State Park. Just past a bench with a great view lurks the top of Monkey Face on the Misery Ridge Trail at Smith Rock State Park. A sign points to the continuation of the trail to descend to the Monkey base. The descent down the other side of the Misery Ridge Trail summit starts a series of steep scree switchbacks at Smith Rock State Park. Be prepared for scree buildup on the switchback corners of the Misery Ridge Trail at Smith Rock State Park. Monkey Face gets further away until the switchbacks take you back to the base on the Misery Ridge Trail at Smith Rock State Park. A Monkey Face look-alike is seen from the Misery Ridge Trail at Smith Rock State Park. A set of stairs and the sign pointing back up the hill at the base of Monkey Face marks the end to the Misery Ridge Trail at Smith Rock State Park. The loop is completed by joining either leg of the Mesa Verde Trail to the River Trail and back to the bridge. NOTE: Horseback riding and mountain biking are not allowed on the Misery Ridge Trail. In fact, it could be renamed “Awesome” Ridge, because that’s what it is when you get up to the 3,360 foot summit. Especially if you decide to hike it from the other direction as described in detail on this suggested hike. Off-limits to mountain bikers and horseback riders, hikers can take Misery Ridge at their own pace, yielding to others that have a faster one. Trekking poles can help for balance as well as an assist in powering up the 600 foot elevation gain. They also help a bum knee on the way down navigate the scree. The .68 mile trail to the summit takes off directly across from the bridge. You soon meet up with climbers on Picnic Lunch Wall after a series of small switchbacks. Continuing up, you pass Ship Rock and another favorite climbing destination, the Red Wall. A series of wooden steps helps hold the crumbling trail in place. Each year people cutting the trail erodes it even more. Don’t be one of them. A lot of volunteers in addition to the park staff work hard each year to maintain the trail system. Once at the summit, scramble up on the rock ridges. Get a great view of the Monument Area to your left. Look down and see the Crooked River as it winds around below. You can often see climbing parties on various routes finishing up their ascent of the free-standing welded tuff pillar. Done for the day after watching the climbers? Go back the way you came–just keep your weight centered over your knees on the steep scree down. You’ll be fine. Not done and want to do the Misery Ridge Loop along the River Trail? See the TIP below. Rested up, you can complete the rest of the trail down a series of switchbacks past the Monkey. You then make a loop back to the bridge along the River Trail for a total of 3.7 miles.